This post has been brought to you by www.criaderodecaracoles.com The online course that teaches you how to start a snail home based business. 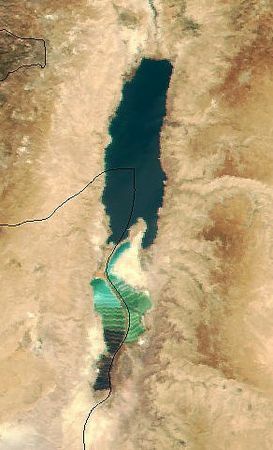 The Dead Sea is famous throughout the world for being the owner of a unique and surprising talent: its high amount of salt favors the flotation of large objects. It is located between the borders of Jordan, Israel and the West Bank. In addition, it is considered the lowest point on the planet, 400 meters below sea level. Although many do not know, the Dead Sea is divided into two large basins separated by a land bridge. The first of them measures almost 50 kilometers in length, while the second barely reaches twelve. Together, they exceed 400 meters deep. As we mentioned above, this sea has a good dose of salt among its components, about 340 grams per liter. Why does this happen? Experts say it is due to the strange combination of two factors: the amount of fresh water it receives from the tributaries is not enough to cope with the evaporation of salt water. This is composed of several mineral salts that also enhance the flotation: sodium chloride, potassium chloride, magnesium chloride and calcium chloride, among others. Despite its incredible size, researchers are alert to the possible disappearance of the Dead Sea. Apparently, for a couple of years now, the water level has decreased considerably. A terrible situation that can find its final end in just four decades. This area has characteristics that favor the treatment of certain diseases. Above all, in the cardiovascular, pulmonary and dermatological fields. There are many people who go to the Dead Sea to take advantage of all these properties. In fact, it is considered to be the largest spa in the world. As a consequence of the excessive salinity of water, the only living beings capable of inhabiting the Dead Sea are some bacteria, unicellular algae or protozoa. Of course, the coast itself welcomes certain plants already adapted to these exceptional conditions. According to experts, this place is one of the most dangerous places to swim in Israel. And you will ask yourself, how is that possible? The problem is when swimming upside down. Your face will be hidden under water, a very difficult position to remedy because of salinity. Given the feeling of suffocation, it is very likely that you swallow water with high sodium content, which will cause an imbalance in your body. The result? Lung damage and even heart failure. One of the most famous legends says that the cities of Sodom and Gomorrah are submerged under the waters of the Dead Sea. According to the biblical accounts, the destiny of both civilizations was marked. A deluge of fire and brimstone fell on them, before the perversion and evil that resided there. It is believed that these events happened very close to the current area.